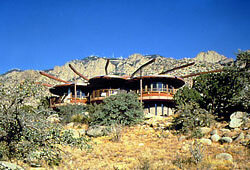 Built on the western slope of the Sandia mountains overlooking the Rio Grande valley this house was built for my father and his wife June. They wanted a house that 'grew' from the site to provide for comfortable entertaining inside and out and views in all directions. The roofs of the upper living spaces are suspended from structure above to allow for changes of level and unobstructed views. DESIGNED AND POWERED BY MIS, INC.